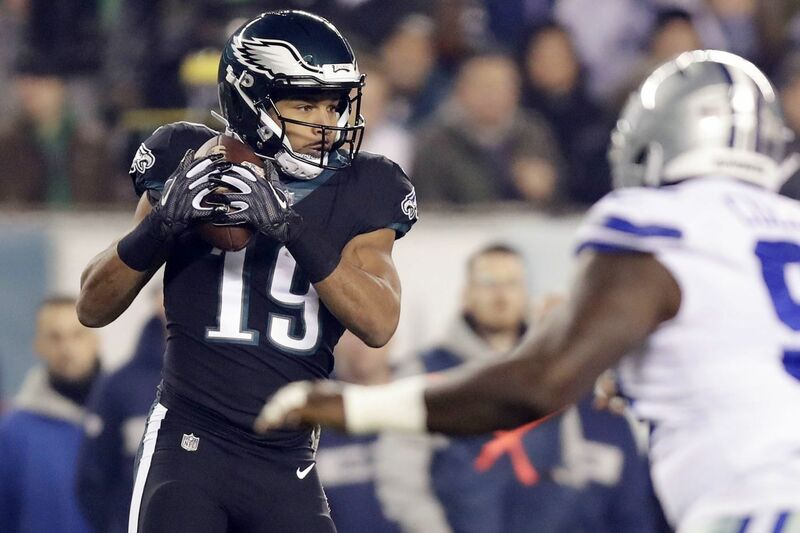 Golden Tate caught two pass for 19 total yards and fielded two punts in his Philadelphia Eagles debut. Golden Tate arrived in Philadelphia a week ago Friday and began studying the Eagles' playbook immediately. He had been with the Detroit Lions for 4-1/2 years before the Eagles acquired him at this season's trade deadline, and of course, the Lions' array of formations and his role within them had long been second nature to him. But after three days with the Eagles, he said, he didn't find himself overwhelmed by the volume of what he had to learn. "The lingo's a little different for sure, the signals," he said. "The way things are run here is a little different on the field." It looked different to him Sunday night, for sure. It looked different for every member of the Eagles' offense, in fact, in a 27-20 loss to the Cowboys, in a performance that reaffirmed what their previous eight games had suggested over and over again: This is not last season's Super Bowl team. This is a mediocre club that will be fortunate to earn a playoff berth, and in a season that has featured too many crushing, inexcusable losses already, Sunday's may have been the worst. Aside from a quickly forgotten moment of razzle-dazzle — Zach Ertz caught a 7-yard pass from Carson Wentz, then lateraled the ball to Tate for another 6 yards — Tate contributed little in his Eagles debut. He caught two pass for 19 total yards. He fielded two punts. During the Eagles' first scoring drive, an eight-play, 35-yard possession that resulted in a 56-yard field goal by Jake Elliott, the only time he appeared on the field was on fourth down-and-10 from the Dallas 38-yard line, when the Eagles acted as if they would go for it, forced the Cowboys to burn their final timeout, then sent out Elliott. At another stage of the regular season, in another regular season altogether, the Eagles could afford to live with Tate's gradual assimilation into their offense. Yes, head coach Doug Pederson, offensive coordinator Mike Groh, and wide-receivers coach Gunter Brewer had made Tate their special project over the last nine days, feeding as much information to him as possible in the hope that he would be as familiar with the offense as possible. "We've kind of tackled him every single day," Pederson said, "trying to get him caught up to just our terminology, the way we call things, how we line up." But if this were, say, last season, when the Eagles had a comfortable lead atop the NFC East after eight games, they could have given Tate a week or two to get comfortable, to find his proper place alongside Alshon Jeffery, Nelson Agholor, Zach Ertz, and the other skill-position players. As Sunday reaffirmed, though, the Eagles of 2018 never had that kind of time, and they certainly don't now. They were not 7-1 ahead of this matchup against the Cowboys. They were 4-4, a game-and-a-half behind the first-place Washington Redskins, who earlier Sunday had beaten the Tampa Bay Buccaneers, 16-3, to up their record to 6-3. The manner in which the Redskins attained that record — they've sort of staggered their way to the top of the division, with some ugly losses along the journey — doesn't matter. The weaknesses that the Redskins have shown all season, their obvious vulnerability, didn't matter. What matters is the ground that the Eagles had to make up. They had plenty, and now they have more. Probably too much, regardless of how well Tate plays for them. They're 4-5, two games back of the Redskins, trailing the Cowboys in the standings, too, because of the teams' head-to-head tiebreaker. The ramifications of this loss are immense, and the calculated gamble that Howie Roseman, Pederson, and the Eagles' other decision-makers had taken was that Tate's presence would improve the Eagles enough to separate them from the rest of the NFC East. But that gamble was contingent on something that didn't happen: Tate had to give them something right away. Perhaps that's an unfair standard, but it's a standard that the Eagles created for themselves with this all-in move. "This will be a work in progress with Golden," Groh had said. "I certainly wouldn't stand up here and say what he's going to do and what he's not going to do." No, he would stand up there and say that Golden Tate would do something, and on the worst night of a disappointing season for the Eagles, the star receiver whom they targeted and traded for didn't help them enough. He didn't help them much at all.